Your resting heart rate (RHR) is the number of times your heart beats per minute (bpm) while at complete rest. It is an indicator of physical fitness as your resting heart rate will decrease as your heart becomes stronger with aerobic exercise training. A low resting heart rate indicates better fitness in people who are in athletic training or a workout program but it may have other significance for people who are not physically fit. A healthy resting heart rate for adults is 60 to 80 bpm. Adults with a high level of fitness may have a resting heart rate below 60 and some elite endurance athletes (such as marathon runners or professional cyclists) have a resting heart rate below 40. An average adult resting heart rate range is 60 to 100 bpm, but the higher end of this range is associated with increased health risks including metabolic syndrome. An elevated resting heart rate of 80 bpm and higher can be an indicator of increased cardiovascular risk and all-cause mortality risk, according to studies. The risk is most pronounced when the resting heart rate goes above 90 bpm. Resting heart rate varies by gender as women tend to have smaller hearts and lower blood volume and hemoglobin, so the heart needs to beat more frequently to nourish the tissues. Average resting heart rate also changes from throughout the lifespan, being much faster in infants and slowing into adulthood. The average ranges also change slightly as you age. Your resting heart rate may be affected by medications. Beta blockers and calcium channel blockers may lower your resting heart rate below 60, while medications for asthma, depression, and attention deficit disorder can raise your resting heart rate. A low resting heart rate in people who are not physically fit is called bradycardia. If you don't actively exercise and have a low RHR with symptoms of dizziness or shortness of breath, you should discuss this with your doctor. Your resting heart rate will become lower as you improve your fitness. Vigorous aerobic exercise, such as running or cycling, has the most effect on lowering your resting heart rate. Moderate-intensity exercise such as brisk walking has less effect. RHR is lowered as the heart muscle becomes stronger and is able to pump out more blood per heartbeat. The body needs fewer heart beats to pump the same amount of blood. If your heart muscle is weak, it needs to beat more times to pump the same amount of blood. Athletes often monitor their RHR to determine when they are fully recovered from a hard workout or race. They know their usual RHR and monitor it to see when it returns to normal after a day or more. A resting heart rate that is 5 bpm above your usual RHR indicates that you may need more recovery time. A high resting heart rate is a sign of overtraining. 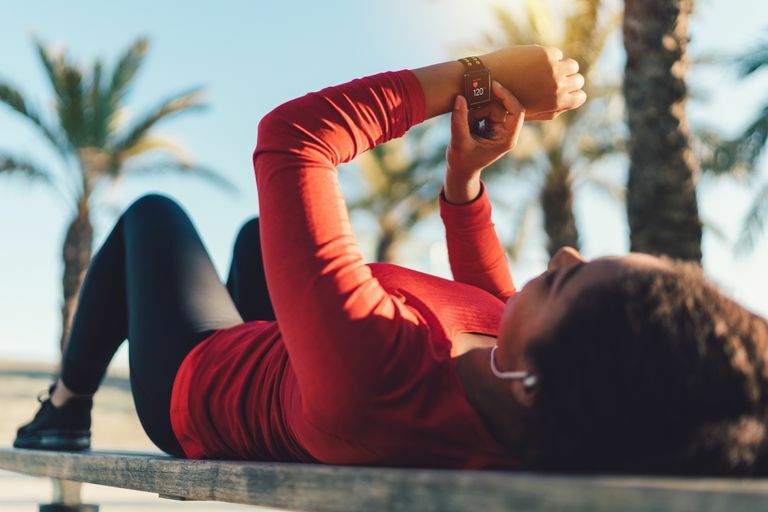 Your resting heart rate may be elevated for one or more days after a vigorous endurance workout, such as running a 10K race or walking a half-marathon. You might delay another hard workout until your resting heart rate has returned to its usual value. Fitness monitors and apps that record resting heart rate daily may use that data to give you a notification as to when you are ready for another hard workout. If you aren't fully recovered, they may recommend a light intensity workout instead. Your resting heart rate should be taken first thing in the morning, before getting out of bed. Your pulse rate will rise if you do any activity, get up, or eat, drink, or smoke. To get a true resting heart rate you must be completely still and calm. If something like an alarm startled you awake, lie quietly for a few minutes before taking your pulse. If you can't take your pulse immediately after awakening, wait for one to two hours after having any caffeine, exercising, or an emotionally stressful event. Lie down or sit quietly for at least 10 minutes before taking your pulse. You need a device that counts seconds—use your mobile phone's stopwatch or clock app, or a clock or watch that has a second hand or displays seconds. To take your pulse manually, place your index and middle fingers on your wrist below the base of the thumb and apply gentle pressure until you detect the pulse. ﻿Or, place those two fingers just to the side of your Adam's apple in the hollow area, pressing gently until you detect the pulse. Count your heartbeats for 6 seconds and multiply by 10. Count your heartbeats for 15 seconds and multiply by 4. Count your heartbeats for 30 seconds and multiply by 2. There are also apps such as Azumio Instant Heart Rate that use the flash on your mobile phone to take your pulse. This can be an easy option as it coaches you through the process and is very accurate. Some fitness bands and smartwatches have LED heart rate sensors that measure your resting heart rate or your heart rate on demand. These are more or less accurate depending on whether you are wearing them snugly enough. It is best to check readings for several days so you can see if any single reading appears to be inaccurate. Your resting heart rate is a useful number to know and monitor when you start a fitness program. Track it over time and let it guide you as to whether you need more recovery time after a hard workout. You don't need to worry if you see some daily fluctuations, but long-term trends can indicate how well you are progressing in building fitness. Liu X, Luo X, Liu Y, et al. Resting Heart Rate and Risk of MetabolicSyndrome in Adults: A Dose–ResponseMeta-Analysis of Observational Studies. Acta Diabetologica. 2016;54(3):223-235. doi:10.1007/s00592-016-0942-1. Ostchega Y, Porter KS, Hughes J, Dillon CF, Nwankwo T. Resting Pulse Rate Reference Data for Children, Adolescents, and Adults: United States 1999-2008. National Health Statistics Report. 2011 Aug 24;(41):1-16. Zhang D, Shen X, Qi X. Resting Heart Rate and All-Cause and Cardiovascular Mortality in the General Population: A Meta-Analysis. CMAJ : Canadian Medical Association Journal. 2016;188(3):E53-E63. doi:10.1503/cmaj.150535.